Our goal is to develop sensitive, inquiring minds by creating learning environments and activities that promote creativity,develop critical thinking skills, and encourage investigation to find answer sand solve problems. We actively seek parents’ participation and support in their children’s social, emotional and academic growth. 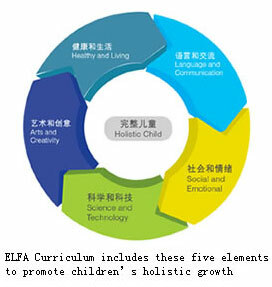 All ELFA preschools offer specially-designed programmes to promote children’s holistic growth. These include Creative Art Programme, Emotional Literacy-Shared Reading Programme, Social and Cultural Education Programme. In addition, ELFA China incorporates a Children’s Music Programme, taught by professional music teachers, to enhance literacy development. Tapping on the expertise and experience of our parent company in early childhood education, preschool management and operations, ELFA offers conducive indoor and outdoor environments that maximise the effectiveness of the educational facilities we offer. Distinctive learning spaces are created to support total child development in areas of logical thinking, bilingual literacy, and creative expression. Outdoor areas and facilities are designed to promote pro-social skills and develop mental and physical agility.